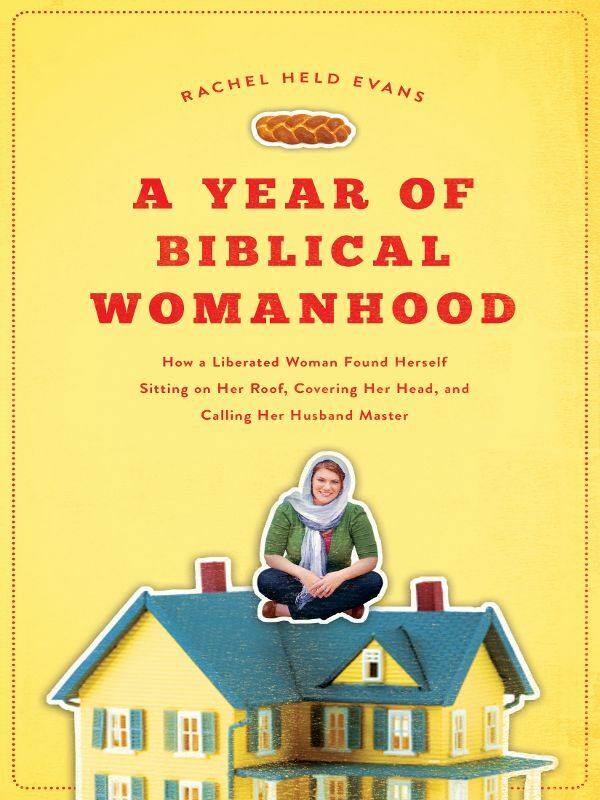 I know I’m not the first person to review Rachel Held Evans‘ new (and apparently controversial) book A Year of Biblical Womanhood: How a Liberated Woman Found Herself Sitting on Her Roof, Covering Her Head, and Calling Her Husband “Master” . But I might be the first person to emphasize that this is a singles-friendly book. Let me admit this right up front: my first reaction, when I see a book written for Christian women, is to turn up my nose. Oh, look, another book about how to be a great wife and mother, I think. I bet it talks about praying for your spouse or, if you aren’t married yet, your future spouse. And no, Rachel doesn’t write a great deal specifically about singles, and she does write a great deal specifically about marriage. She is, after all, married. But she is clearly a married woman who is aware of the concerns of single women. The premise of the book, for those of you who are male or have been living in a media vacuum, is this: Rachel Held Evans spent a year trying to imitate, as literally as possible, various Biblical depictions of women. A lot of people have disparaged the book as mockery of the Bible, while a lot of people at the opposite end of the spectrum have disparaged the book as old-fashioned or unnecessary. But if you’ve truly read the book, it should be obvious that for Rachel, this was a labor of love. She didn’t set out to mock or disprove the Bible. She set out to wrestle with it. She set out to live in the tension. She set out to surrender to God’s stories. And in the end, she didn’t come away with a blueprint or job description of a Biblical woman. She found plenty of descriptions of women in the Bible, though, and she found that the Biblical concept of womanhood is simply too complex and varied to be summed up as a to-do list. Case in point: the chapter on the Proverbs 31 Woman. Did you know that in Jewish culture, it isn’t the women who memorize Proverbs 31? The men do! It isn’t a recipe for how to be a great woman, it’s an example of how men should praise their wives. The Hebrew phrase used in Proverbs 31, eshet chayil, is best translated as “valorous woman”, which means a lot more to me, as a single woman, than “a wife of good character”. Growing up in the Church, I must have heard a thousand times that my highest calling as a woman was to bear and bring up children. While men could honor God in varying capacities through work, family, and ministry, a woman’s spiritual aptitude was measured primarily by her ability to procreate. Even as a child I noticed that the church deaconesses hosted dozens of wedding and baby showers each year, but never a housewarming party for a single woman or a celebration dinner for a woman who passed the bar or graduated from medical school. That passage told me two things: Rachel Held Evans understands how single people are overlooked in the church, and Rachel Held Evans doesn’t view me, as a single woman, as someone who’s worth less than a married woman with children. I could go on and on about what a great book this is, but frankly, there are lots of people who’ve done a better job than I could–Ben Witherington, for one. I could talk more about the controversy that has grown up around the book, but Rachel Marie Stone has done a great job of discussing that. I just want to recommend that single women not pass this book over thinking, “Oh, it won’t address single women.” I want to recommend that men not pass this book over thinking, “Oh, it won’t address men.” It does both. And I, for one, am living for the day someone calls me eshet chayil. I love infographics. I’m not a mathematician, and numbers make my brain feel fuzzy, so I love having a way to visualize what those numbers really mean. Given the caveat that I am absolutely not gifted in math, there may be errors in the following infographic, and if you find some, please feel free to point them out. That said, I would like to present Singles in America: The Changing Face of Adulthood. Using data from the U.S. Census Bureau and Pew Research Center, and quotes from Bradley R.E. Wright’s book Christians Are Hate-Filled Hypocrites…and Other Lies You’ve Been Told, I compiled the following graphical representation of singleness in the United States.